Sunny Health and Fitness are one of the best distributor of creating high quality equipment and products that fulfills your fitness requirements. Fifteen years ago this business was established in Los Angeles, California, and from there they use to carry there fitness and health equipment from top constructors which were found in China and Taiwan. This company works as a link with the top manufactures, thus providing a product in much less price than the industry. They quality and durability is never compromised by Sunny Health and Fitness stands, and they are committed to provide excellent customer service which made this organization one of the leading and fastest growing companies in gym equipment market across the globe. So for that the newSunny threaded solid chrome barbell is one of the best pick to tell that how this company ensures its product durability, quality and affordability. The Sunny threaded solid chrome barbell in today’s barbell market lays great foundation and motion, especially towards beginners and women. 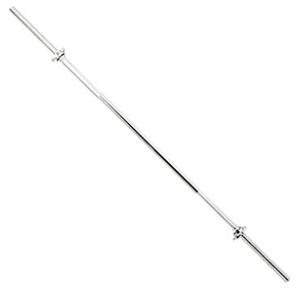 The barbell is constructed with solid chrome steel having a length of Sixty inches. The barbell is compatible to handle weight plate having a one inch center hole. 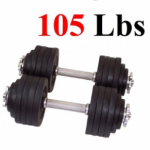 Having a weight of only thirteen pounds, the bar still have the capability to withstand weight up to 250 pounds. Star locking collars are also included in the package to prevent the plate from sliding off the bar. With the tendency to perform full upper body workout, this bar is perfect to fit your home gym needs. 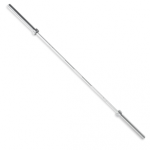 The sunny solid chrome bar is essential and convenient for commercial and home gyms. The barbell consist of 60” solid chrome plated steel having threaded ends, which makes the weight plates to be secure while lifting heavy. 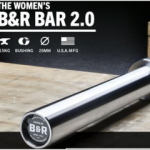 Though the bar isn’t really standard one, but it still fulfill the needs of starters and women who are looking for a light weighted bar, with a maximum weight capacity. The weight of the bar is only 12 pounds which I think is best for beginners as they have to slowly increment the weight while focusing more towards correct form and movement. Starting the exercise directly from heavy weight is highly not recommended by professional athletes and trainers, so you have to steadily increase the weight with respect to your size and age. The grip of the bar is one of the most essential aspects of barbell to be considered as it helps you to achieve strong and tight hold. To properly grip the bar, knurling is very important which have many levels. In Sunny threaded chrome bar, the knurling is moderate which lets you hold the weight up to 250 pounds very easily. Though, it may be very surprising for many users to think that how can a bar having weight of only 12 lbs. can bear that much of weight, the answer is pretty simple and it is because of their durability and hard chrome construction. Whereas, to let the weight plates not clang and wobble during lifting, they are secured and fitted with star locked collar which are provided with the sunny threaded barbell package and helps the plate to be in their place, thus reducing a chance of sliding off. 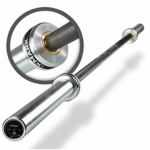 The barbell comes with brass bushings on which the whip and spin of the bar is adjustable. You can’t expect a good spin in such a low priced and weight barbell, neither beginners will start their workout from CrossFit or deadlifts so the spin is not really that level of concern in such price tag. The bar is constructed with Solid chrome which is considered one of the best material to prevent rust and corrosion. Maintenance is not really required on chrome bars, but it’s still recommended to do. With the sunny threaded solid chrome barbell you can easily perform total body workout with variety of exercises in your home or gym. Workouts like, front squats, back squats, zercher squats, overhead squats, rack-pulls, deadlifts, bent-over rows, overhead presses, push presses, snatches, bench presses, rack-pulls, stiff-leg deadlifts that will provide effective and superior results. There are many benefits of lifting, one of the main is that it makes you stronger and makes you to perform certain taskswith comparatively less work and effort, hence increasing your confidence and mental health. The greater is your energy the more productive you will going to be day after day. These things obviously doesn’t arrive over-night, but requires a lot of passion, hard work and dedication. Having a good sleeping schedule and positive think may improve your weight training. You’ll also stay away from many diseases due to the increase of bone density through lifting. While your metabolism and health going to be much better. The bar comes with a weight of only 12 pounds. The bar have the weight capacity of 250 pounds. Consist of solid chrome construction. 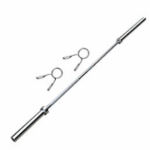 The bar consist of dual knurl marks according to IPF and IWF standards. With moderate knurling, the bar comfortably fits on your hand. Star locking collars are provided with the package to make the plates be in their respective place. The bar is sixty inches long. Weigh plates with a hole diameter of one inches can fit in the barbell very easily. Have the ability to perform full body workout with different type of squats, bench press and curls. The threaded chrome sleeves can hold up the weight up to 250 lbs. The bar comes with a ninety days manufacturer warranty. The bar is constructed in China. 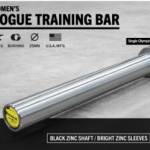 In my opinion, the Sunny threaded solid chrome barbell is one of the best fit for beginners and females, who like to start their lifting experience with an affordable and comparatively low weight barbell. I purchased this barbell for my wife and after experiencing it too, I came up to a point that this barbell is best in terms of durability, affordability and performance. The barbell came in good packaging, with free shipment and within three days. The barbell came in a very good condition with that solid chrome which was too shinny from every part. The bar looked very sturdy. I started working out with this barbell in a medium weight set, I experienced that the barbell fitted very comfortably in my hands due to the threaded solid chrome. While the star locking collars made sure that the plates are in their place and doesn’t clang while lifting. The only reason I stopped working out with them was its minimum weight capacity of only 250 pounds. Though for beginners this is workable, but for an expert like me this is not the right fit. Overall, a good piece of equipment and fully recommended to every beginnerweight lifter out there. 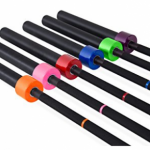 The barbell is very affordable which comes with extensive features and benefits. 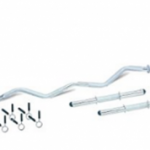 The bar comes in good quality, having chrome plating which prevents the bar from getting rust. Comes with a ninety days manufacturer warranty. Can easily fit in your palms due to threaded chrome sleeves and moderate knurling. Star locking collars prevents the plate from wobbling and clanging during heavy lifts. The bar is not standard, most of the plates are having trouble getting fit in properly. Changing of weight takes longer time because of star locked collars. Not really recommended to professional weight lifters due to weight capacity of only 250 lbs. Can’t stack it on the rack because of chrome construction.